Few days ago the 7th edition of Enoforum has concluded. It is the international convention dedicated to the most up to date research about wine sector. Italian and foreign specialists met together in Arezzo Fiere e Congressi to share their experiences and to know the most innovative news in the sector. CDR WineLab® took part to the event, organized by Vinidea from 7th to 9th of May. Participants could attend a rich program of seminars and meetings. In the meantime they could visit stands of companies that offer services and technologies for the wine industry. CDR WineLab® had his own stand. Inside the CDR stand our technical staff, including CDR WineLab® Specialist Simone Bellassai and the Marketing Manager Gabriele Casini, met the public of the convention. They gave practical demonstration and information about our system for wine analysis. 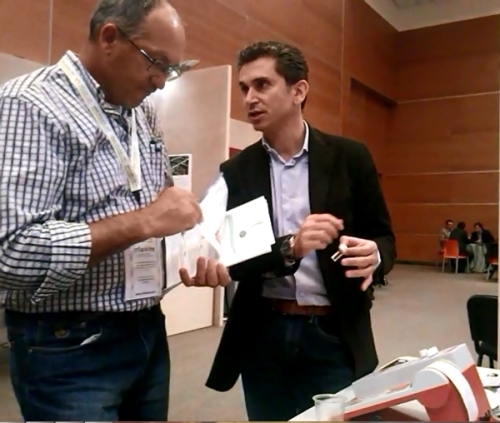 CDR WineLab® drew attention of oenologists, winemakers, professors, students and researchers. They stopped at our stand and tried CDR WineLab®, showing enthusiasm and interest. Enoforum 2013 has represented a good chance for comparing experiences and participating to the debate of the scientific community. You can see how our experience in Arezzo was, photos, convention’s subjects and comments, at the tagboard #Enoforum2013 link. Wine analysis: CDR WineLab® takes part in Enoforum 2013 was last modified: May 22nd, 2017 by CDR s.r.l.